"Good Customer Service - Great follow through"
No more double entry! Streamline process from our big commerce store to Quickbooks Enterprise 2019 on the right networks cloud environment. It seems we have a dedicated group of customer service reps that handle our account. You are able to establish a relationship and feel taken care of because they know your account/issues. Techs are polite and well trained in their product. Implementation was not a smooth process due to our Cloud Based Quickbooks product. Time zone difference had resulted in many late day/evening service appointments.Understanding techs accents are a challenge too. Ask for written workflows. Help center online is being updated and some info is obsolete. Efficiency issue resolved. No more manual entering of e-commerce sales. That and, the clerical mistakes are avoided due to download ability. "Stay Far Away from this software if you use WooCommerce - Horrific Integration & Worse Support"
Years ago it used to work great and be competitive - now it's bloated, cumbersome, out-dated. Horrible support. Have been bringing this to their attention for months with no resolution. Keep promising to look into it, but they don't . They finally send reluctant email admitting that the reason the competitors plugins work properly is because the competitors (like ShipStation) are PROPERLY using the WooCommerce API and Webgility is not. When asked why they can't use the API and properly make a decent plugin, they say they'll get back us - but don't. Stay far away from this program if you use WooCommerce. Their integration is archaic and non-standard. They are also charging triple what competitors (like ShipStation) are for same features. None. They have caused more problems and costs than they haver been worth. Switched to ShipStation and in one second everything worked, no lost productivity. "Excellent product form many interopperability solution's "
Webgility has been around for some years now. I have worked with them on many occasions with my client base. The best part about this product is the support. Efficent, consistent and effective best descibe your support experience. This is important when things are not working, you can reach them quickly and they know the product well and provide solutions quickly. The product as a whole is easliy configuable and the onboarding team is solid. This makes it a well rounded product that has matured very well offering more options each year to their line. Its is a must if you need a solution like this. Great product great support reasonable price. It allows us to move products and trasactions between our e-commerce platform and our accounting platform. "Product and Support Mediocre at best"
Nothing. we are a small business that handles 4 websites and we run Quickbooks Enterprise with a fairly big data file. as many businesses today we run our software in the cloud Windows 2012R to be exact. The software has presented so many errors, it modifies the setting itself and when they run updates you have to redo your configuration settings otherwise it will create a mess on your QB file. recently we started to get an error where after importing orders QB becomes unresponsive and give an error, where all customer lists are gone. so if you don't Religiously back up DONT RUN this. This has created more problems due the amount of hours talking to Unify and Quickbooks. By the end of this month, I'll discontinue the service with hem and move to a better (hopefully) solution to import from Magento into QB. this software might be a good solution to a moms and pops operation. but when it comes to a bot of more muscle this is defently crap. unless you love to have your entire IT team troubleshooting something that SHOULDN't be an Issue. I HAVE SAVED SO MUCH TIME WITH THIS PRODUCT I LOVE IT!! The interface response time could be improved. I find the interface is a little slow to respond when hovering a the mouse pointer over an order. Ask a lot of questions. Small items such as provincial tax mapping was something that I missed when setting things up. I also use my own payment processor, Canada Post and Canadian payment processors are not support,ed, but that wasn't a show stopper for me. I'm connecting my 3DCart store to Quickbooks Canada Desktop. This seems to be a challenge for a lot of integration companies. "Software doesn't perform and customer service is terrible"
I love the idea of having my sales synced automatically for me so my book keeper wouldn't have to input the information. However, this software does not consistently work for that purpose. My sales data inconsistently synced into my QBO and I constantly was on the phone with support trying to get my issue resolved. They were never able to resolve my issue with my sales not syncing nor did they offer me a refund for the services I paid for that did not work. Customer service is terrible on all ends, from the support desk and having to talk to a different person every single time about my problem to my account manager who failed to understand the extent of my issue or offer me a refund for the services I paid for that did not work. Would not recommend Unify to anyone. This software does not work properly. I have realized that it would be less expensive for me to have my book keeper enter sales data than pay for a software that doesn't work and have to spend months and countless hours on the phone with support to try and get my issue resolved. "Unify money back assurance is a farce. Very misleading company, employees and culture." That I canceled my credit card that they were charging. The onboarding process did not work. The account was not set up right. Sales and support said they would credit payments and did not. A receipt stated a credit was issued but in reality there was a debit issued. Email correspondence went on for 3 months stating they would have fixes for the issues and nothing ever resolved. COGS did not import for ebay sales. Ebay (marketplace) fees did not import. Shipping costs (from Shippingeasy) did not import. Unify did not deliver as promised. I would not recommend Unify. No business problems were solved. The best technical support ever we received from Himanshu. He worked with us for long time and finally we were able to get fixed our inventory issues. Previously I had to enter the details manually in QB and on store but he helped in automating it through scheduler and since then everything is working fine. We got charge for month even we din't use webgility for almost 20 days and I had to do lot of follow up with Kristina and then again Himanshu and customer support team helped me in getting it credited. It makes our operation so simple. It downloads all orders from the store, allows us to check addresses, quote with multiple carriers and process shipping. Then is posts those orders to QuickBooks and back to the store, notifying the customer their shipment is on their way with their tracking number. Prior to Unify, we were manually entering data over & over. Now our manual data entry is almost zero. Fantastic product that works. Not much. It's a little tricky to setup, but their staff are great at guiding you through any problems. The software has worked flawlessly 99% of the time since we moved to it in summer 2012. If we ever have an issue, their support team got us back on track right away. I would highly recommend giving it a shot and seeing if it works for your needs. We have reduced our fulfillment time and order processing time, saving money and improving the customer experience. We have reduced manual data reentry, saving time and reducing the likelihood of errors. "Webgility Unify Enterprise has solved a ton of my headaches!" Webgility has replaced a cumbersome order management tool and works with Quickbooks Enterprise perfectly. We reduced our data entry time to zero, our payment processing time to zero and our posting back to the webstore to zero! It is amazing how much time it saves. We have 8 webstores currently (Shopify, BigCommerce, PrestaShop, eBay) and will be adding Amazon shortly. It even works with eBay motors. I am having an issue with it not being compatible with lots in Quickbooks. Our type of Quickbooks account forces us to have lots in our inventory. Also the package we have does not have automatic updates and I have to update all users manually, but hopefully we can upgrade to the big one eventually. Your team will be scared to change, and it took me 1.5 years to convince them this was worth the time, training and money. Once Webgility is set up, very few people will have to be involved in it. Encourage your shipping and accounting team to take the onboard training as it will help them figure out how the payments and shipping should be set up as well. Unify Enterprise has solved our problem with inventory being constantly out of sync on our webstores. It made the problem of drop sipped orders much easier and faster. "Great Software, and even better Customer Support"
When looking for a good software package, one of the things I find most important is the accessibility AND knowledge of their support team. Mayur was fantastic in is assistance to our integration. I'll be honest, I was a little hesitate and skeptical of any integration that would alter what we're currently doing. I can tell you, I'm completely satisfied, and very pleased the integration went so smoothy. Solution - Unify was able to easily integrate this, and one added feature we didn't realize until after the integration, was the ability to communicate tracking numbers back and forth between our online store BC and our Quickbooks software. Good follow up regarding installed software. Knowledgeable, helpful reps/techs/trainers from start to finish. We intially had a install delay due to a problem with hosted network. Unify did a great job of handling the problem and we were back in business in less than a week. Had a follow on problem with tying into our Fedex Account but after some additional work fixed that problem as well. Namit did an outstanding job on the final training and install!!! The software is great but the people at Unfiy are really great! They are the reason we use this software as they are knowlegeable, easy to work with and I feel like even when there is a problem, it's going to get resolved. Nothing on Unify's part. Only problems with install were with the web host, not Unify. Both problems, one with software and one with login into our Fedex account were on the Cloud server's end. Excellent support and product works as advertised. We have elimated the tiresome process of manually entering our weborders, manually processing the orders with shipping and billing. It has also eliminated our need to send manual emails informing customers of shipping information, which has put our incoming calls related to this at nearly zero. Finally, it has open up additional time for our people to focus on more important tasks. In short the software is doing what it is supposed to do, save time and money. "An incredible piece of business software"
This program is super user friendly and intuitive, is backed by an awesome and quick to respond support team. It has streamlined operations and allowed us to make staff more effective and efficient in their daily tasks. Ability to use multiple stores - we have eBay, Volusion and Amazon and it makes order entry from all three platforms simple. We do not use the shipping or tax features so I cannot comment on that section but imagine they would work as well as the rest of the software. New features are always being rolled out. Webinars and Customer Service / Support is great and keeps us very well informed. Posting to Quickbooks can be a little slow, but that is not a reflection on Webgility in my opinion (our quickbooks database is over 2GB). We batch orders and may try to push 10 - 12 orders or more at a time and it will take a minute - still lightning fast compared to the method of having to type each order daily! Go for it! Make the phone call and have them setup a demo. It was worth every penny and continues to pay for itself daily. Able to reduce double entry which is a BIG win! We used to manually enter every order into Quickbooks after it was already entered in the e-Commerce store. Reports are able to be generated much quicker in Quickbooks as the data is there much faster. Paper waste reduction - we used to have to print multiple copies of orders and invoices to show their payment and ensure they were charged, we have been able to reduce paper usage by at least half. First, I love the ease that we are able to transfer our commerce platform info over to Quickbooks. We have our accountant linked up and we have saved a ton of money because it is such a time saver. Second, the newsletters that webgility sends out are always full of actual useful information. Not fluff or info not relevant to our business. Customer support is easy and quick, and they are quick to help and resolve your problems. Not much actually, it took a bit to hook it up at the beginning, but that could've just been the back and forth to make sure we were doing the proper things. After it was set up, we have had no problems that haven't been solved with a quick phone call. Absolutely, we actually recommended it within the first 4 months of using it. A fantastic compliment to an online retail platform. We needed to have quick and seamless way to transfer data and sales from our big commerce platform to quickbooks. We looked into a wide array of different platforms before we decided on this one and have been more than impressed. We realized that the amount of money that we saved with the monthly fee saved us triple that on data input fees. Paying for a order by order data transfer from our bookkeeper was an expensive and time consuming process. With the webgility app, orders are uploaded and transferred with the click of a button. The cost is very high for a software program. We use Quickbooks enterprise solutions due to the hundreds of thousands of customers in our database. The ECC software is more expensive than our Quickbooks program which really makes no sense as it only does a handfull of functions compared to Quickbooks. make sure you read all of the fine print, I spent months setting up this software with their support team and when we went live, the salesman hit us with several hidden costs that I point blank asked him about over the phone. I was basically lied to. The owner of the company did reach out and corrected the issue which was very professional and the only reason at that point I stayed with the company. The salesman was basically a crook, so like I said "read the fine print" don't rely on the salesman to explain the costs of the added modules or different pricing structures. "Webgility and eCC - Great software and tech support"
We have been using Webgility for the past 2 1/2 years. This software really makes it easy to import orders and items from our Magento store to Quickbooks. We've had to call Webgility tech support several times for different issues and each time they have been very helpful and responsive. They have even customized several pieces that we have needed and added fields for us. The software itself is very reasonably priced. If we had to develop this ourselves, it would be very expensive. All in all we are very happy with the service and software from Webgility. There are some features and functions that we would have liked to have out of the box such as transferring notes from our Magento orders to Quickbooks purchase orders. Webgility and eCC allow us to transfer data between our Magento store and Quickbooks seamlessly. I really appreciate the quick responses with customer support. The program tends to have so many levels and options and it can get a bit confusing for an amateur. Using Unify plugin to integrate WooCommerce with Quickbooks for automated invoice creation. "Great Experience, People and Program"
It works consistently and doesn't need to be babied. Customer Support is always available. You don't have to be a tech to use it. Overall as a business you want something like this to work and run in the background and it does both. The ability to keep from overselling on a variety of retail platforms including brick and mortar stores, and in doing so increase sales and keep our customers happy! It works! There are so many of these bridging software programs out there, we stuggled to find the right one to connect Quickbooks Enterprise and our Wordpress e-commerce. This one has extremely few hiccups (just a learning curve getting it set up), but I've not had a single issue getting orders synched over or inventory not reflecting correctly. It worked so well on the first 2 sites, we'll be setting it up on a third! We have a lot of sub categories (i.e. BRAND: JACKET: GENDER: PRODUCT: ITEM NUMBER) in quickbooks, so despite having unique Item Numbers, Webgility pulls the whole train (what is in the brackets), thus, I had to manually map all of my items. Webgility Support helped me through it, but it certainly wasn't painless. They gave us a free sample which we demo-ed on one of our smaller product lines to test and make sure it worked - it was 100% appreciated and worth it. We have 3000+ inventory items in our warehouse that we sell online and inventory levels flux daily. Webgility allows our website to accurately reflect if a product is available and prevents us from doing any entering errors from double entry. We implemented eCC (now Unify) several years ago. Since the upgrade to Unify we are able to more fully utilize all of its features. Its primary benefits to us have been to allow the downloading, fulfillment orders, posting to QB and to our online store, integration with UPS and USPS. Additionally, we are now able to successfully sync inventory and pricing across accounting systems and Big Commerce. Support from Webgility is outstanding! make sure that your shopping cart fully supports all features of integration with Unify. After trying some other, HORRIBLE integrations with WooCommerce and Quickbooks POS, this software is a breath of fresh air. Because it uses the API, the integration is absolutely seamless and the customer support is FANTASTIC and walked us through the whole process. It would be great if you could offer monthly billing - the software is fantastic but something that initial hit of cost is a bit too much for new store owners. Absolutely you should consider Unify Enterprise!! The software is fantastic, the support team is always there for you, and it is just plain worth it for the money. We were looking for an integration that would seamlessly integrate prices and inventory from Quickbooks POS to WooCommerce without us having to constantly QA it. This software is a breath of fresh air and has made life SO much easier for us! It links through the WooCommerce API which means that we never have to update plugins and all of the information for the software is in one place. Best of all the Unify Enterprise software dashboard is extremely easy to use and customizable. Even more - the customer support is AMAZING! I always get an answer and if the tech support technicians don't know it right away, they'll go find out and then let me know! They really know their tool and I know I'll be highly recommending it for all of our WooCommerce/Quickbooks POS clients in future. We've been very happy with Unify after switching from a competitor. Like all new software integrations we needed help setting up the data transfer to ensure the data was posted as we required. Outstanding on-boarding and support! Quick response, courteous and professional. We highly recommend this company! Like all new software integrations we needed help setting up the data transfer to ensure the data was posted as we required. The product has some limitations in product match with the Xero integration that is not a problem with Quickbooks. Integration between various online marketplaces, our website store and Xero accounting software. Highly reliable saving significant hours of data entry and preventing errors due to the manual entries. Product is fine, just didn't quite work for our company. Customer service is horrible! Requested a refund within the 30 day window and was told it would take 7-10 days. On day 14 I call and they say that it never was processed and would take another 3-5 days. Customer service rep did not care at all that their system failed and was unapologetic. Get better customer service reps that actually CARE about their job and their customers. Customer service rep did NOT care that yall's system failed and refused to apologize or offer any sort of compensation for their failing. "Webgility has the best customer/phone support hands down!!" Their phone support is top notch, always going above an beyond my needs. Today I was on the phone with Himanshu Patil for almost 2 hours while he assisted me in re configuring a new PC and 3 other PC's we use. He was extremely helpful and super polite. Nothing, the application does what it is supposed to do. "Order and product syncing is horrible!" Digging here.... The Tech Support staff is always very polite. I should know, as I've called them dozens and dozens of times over the 3+ years I've used Webgility! I've had considerable and consistent problems with Webgility. It doesn't seem to properly sync my products and orders between my BigCommerce website and my QuickBooks POS for more than a few weeks at a time, sometimes much less. Most of what I carry/sell are one-of-a-kind art kaleidoscopes, so it's absolutely critical that my inventory #s are accurate on my site! Every time I notice that that there's an inconsistency (difficult to keep track of, with over 1,100 products! ), I end up being stuck on the phone with Tech Support for hours at a time, costing me time and money away from my customers in my brick-and-mortar store. They never have an explanation as to why this keeps happening. They just uninstall & reinstall the software, find the problem, and fix it. I'd would GLADLY switch to any other software if someone could recommend one that would work better!! If you have a very large # of products, I would highly recommend that you consider any other software out there! Webgility was recommended to me by my website developer when he and I started building my site. He's since been shocked at the problems I've had with it. "Painful in the beginning but now it meets very minimal expectations. " Creating Shipping labels is a breeze. We ship between 60-100 packages a day and shipping labels used to take us hours to create. With Webgility that time has been reduced to less than an hour...most days. Initial integrations with Quickbooks Enterprise, UPS, USPS and our eCommerce website was seamless. Tech Support seems very knowledgeable and eager to assist. They do not always have the answers to problems but they always have some sort of solution to make things work. 2. The scheduler that is supposed to download customer orders and post to Quickbooks fails miserably if left running for 12+ hours. Tech Supports solution is to shut down the program on the Server and restart with a new instance of the scheduler. Sort of defeats the whole "automation" concept. 3. Default shipping settings for UPS, USPS, etc constantly reset themselves for an unknown reason. No help from support on this issue. We have to set up the shipping accounts at least monthly. 4. Numerous bugs with SQL connection between multiple PC's. We did not have these problems with other similar software vendors. 5. Inability to "edit" packing slips before printing. This seems like a feature that should have been included but has been forgotten. The two previous order management applications we've used at least had this ability and we've been forced to use another application in conjunction just for this purpose. 6. There is a setting to "Ignore" Inactive Products when syncing inventory with Quickbooks that fails to work. This creates an issue when posting orders to invoice in Quickbooks. Inventory can sometimes "Map" to an Inactive Product which creates a huge problem. Support said this should work as expected but has not been able to provide a solution as of yet. Creating shipping labels has become less time consuming. Updating order status on our website has been simplified. "Great Tool for eCommerce "
The Quickbook integration app for desktop is great. It has a scheduler built into it so all my transactions are downloaded on their own. If there is a entry line that doesn't line up, it will alert me, allow me to map it to an item in QB, and then download. Saves me a lot of time. It is also priced well. A definite value when looking at time versus cost. I wish there was a better way to import the taxes from orders. It's pretty basic in that manner. It wants to import the tax as a line item into QB instead of applying it to QB's existing tax system/process. This has helped streamline accounting. The process of managing online orders has become a breeze. With the automatic importing of orders, we don't have missing orders in Quickbooks at the end of the month. It is very easy to use and teach someone else how to use it. 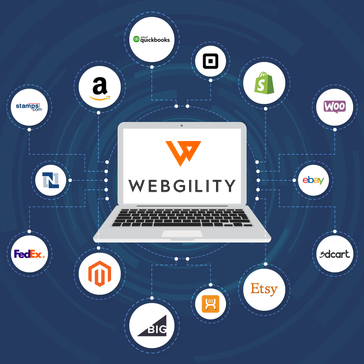 Webgility takes care of a critical need as a connector between Magento and Quickbooks. We were able to reduce the manual work in the warehouse and add inventory to our Magento store. Most importantly are the people that work there. I have come to work with a few of them and they are excellent. Both knowledgeable and helpful. In some cases, if there is a feature that is not available, they will work with developers to see if there is a way. For me, the service is what puts Webgility over the top. Time zone means I need to wait until 11:00 ET to contact someone for help via phone. If you are looking to connect Magento and Quickbooks, I can't think of anyone else better to work with. Must have features like orders to receipts and adding inventory to Magento are only the beginning. There are still features we haven't even tapped. Up next will be 1) creating products in Magento and 2) using bin locations to print pick lists. It's a lot of functionality in a small package. The other surprising thing was the amount of time to get up an running. Our web site developer estimated 40 hours to set up the back end. My IT guy did it in maybe 15 - 30 minutes. When I set up for the 3rd time (we are moving to unify and QB enterprise), I received some help from Namit and it was less than an hour but we chatted a bit so that is the only reason it was a bit longer. I LIked how it integrated really well with my online business. I was able to do everything I needed in one area. The tech support, although slow to respond sometimes, were still very courteous and friendly. I don't like how it seemed to get "stuck" whenever I made a small change to my website. It would take almost 2 business days to have a tech find the problem and fix it. One day, I was working with a tech for 8 HOURS straight. Just to help him navigate around my computer and find the bug. I also don't like how just recently ECC was changed to Webgility. I just upgraded my ECC account, only to find its outdated and many online sites do not work with it (ex. shopify). I no longer use webgility. But it was solving the problem of having to integrate multiple softwares (shipping, quickbooks, etc). From Onboarding through complete integration with QB Enterprise the entire support team is responsive and high competent. The support structure is extremely customer centric providing advanced support with no need for endless calls and emails. All software has issues - Webgility is no exception...however we have been able to work through every issue in a timely manner. Better/more integration with Amazon FBA- orders, inventory reconciliation. Importing thousands of multi-channel orders, posting to QB - mapping accounts by product class - all seamlessly. Our reports are updated daily. Accounting is happy, operationally we have better data - its a win win. "Great product to integrating Quickbooks and Woocommerce." Works well to integrate Quickbooks and Woocommerce. It eliminated data entry from online sales. It allows phone order entries and credit card processing. It also links keeps our inventory levels up to date on our website. Very good product. When we do have problems, the staff at Webgility is quick to help. I have even made suggestions that they implemented. I was very impressed that they took my suggestion and made it a reality in a week. The program has glitches at times but the Webgility staff is quick to fix. A few glitches can be expected with any program. I do wish refunds could be processed through Webgility. I haven't made the suggestion but plan to. No more manual entry of sales into Quickbooks. Credit card processing of phone orders are easy. They are knowledgeable and very patient with me and my constant questions while I learn. I would like to especially thank Chintan Jadhav for all his help. I wish every screen had customizable columns for viewing. There is a learning curve but well worth the effort. Quickly syncs my website to my QB and visa versa. "Fantastic Service - Customer Service the way it should be." I'm a huge customer service guy. I bend over backwards for my customers. It's the way it should be but frankly, it's so very seldom seen in today's, "It's all about the bottom line and who cares if they get torqued off and leave; someone else will take his place" mentality. It rubs me raw. Which is why the few times I've ever had issues with my setup, it's been unreal how Webgility has just killed it. The techs are intelligent and helpful. They actually listen (shocker) when I've explained my problem and rather run through a list of queue cards in their training manual - they have been able to quickly help me fix the issue within a matter of mins. It's the way customer service should be done. Period. Oh and would I recommend them to a friend as this review asks as a first question.? I just did 5 mins ago. Nothing. I can't complain about the wait time, the ability of the tech to understand my issue nor the time it took for him to fix it. Everything was awesome. Do it. You'll save time and money and you'll definitely not regret it. Accounting. The number one thing I hate as a business owner is doing all the backend book work. Webgility has helped me drastically reduce the amount of time I'm hammering info into Quickbooks and more time providing the type of customer service my customers have learned to expect. Unify has the best customer service! The reps are always so happy to help and so easy to work with! There isn't anything I don't like :) The product works just like I need it to! When our business took off and we needed a way to get the orders from our website into Quickbooks, Unify took the hassle out of that process! It's so easy! "QuickBooks Items got "un-mapped" on webgility"
The speed by which someone picks up the phone when you call with an issue! It's very fast! No other company provides service that fast! It does have issues sometimes (like any other application) - BUT every problem is solved in no-time! Syncing our websites orders into QuickBooks! "ECC for Quick Books Point of Sale"
The ability to bridge our Big Commerce hosted web site with our Quick Books Point of Sale system. This allows us to provide more accurate information related to availability of items listed on our web site. We have have close to 9000 line items listed on the web site, and even more on our QB POS. All of our contacts with the support staff at Webgility has been great. They are able to solve the problem and get us back on the road quickly. And, that alone speaks volumes. These people get to solving the issues! And, they follow up to make sure things are working via email. The support staff is what seals the deal for us! First we populated our new web site, and then we had QB Services install the POS. After our learning curve, we took on ECC. That we did not start using it sooner, but we had a lot of change in 2014 so we made small steps with integration. We are a happy user! First and foremost, the ability to have near real time inventory posted on our web site. This is our number one reason for our use of Webgility. It was recommended to us by our QB Point of Sale supplier - QB Services. And, it works as advertised. We are able to give customers a very high degree of order fulfillment with ECC. This has helped provide a better customer experience when using our web site. With our old web site we had had no option for showing inventory status, short of making the product invisible. Now, ECC provides accurate inventory levels due to the integration of ECC bridging our QB POS system and our Big Commerce hosted web site. Time savings with generation of shipping labels and proving customer information has sped up our ability to process orders immensely. This is another area where we have really come to appreciate. ECC makes generating shipping labels a breeze using UPS and USPS. No longer do we have to cut and paste from our web site into UPS Worldship or Stamps.com. "Webgility is inexpensive solution for website ordering/accounting software intergration"
I found this program very easy to use and also to set up new stores in. I've also had good experiences with support. I sometimes find that Webgility will skip orders, requiring another download and costing my time. We don't use all of the available features, but you are are looking for an interface between your online stores and accounting software, Webgility is great. Overall a great interface between our online stores and accounting software, at a great price. "Amazing tech support after a server crash." After our server became unresponsive and required a reboot, it seemed we lost our SQL server and eCC database. All it took was a single call to thier tech support line where Piyush took control of the screen remotely and went through a dizzying number of steps to remove/reinstall/update our SQL server software for us and saved all the eCC data, and restored the connectivity between QB Point of Sale and our OpenCart database. The tech support with Webgility is incredible! It takes a bit of time to learn all of the options available - many of which I don't fully understand. Orders placed on our site through the OpenCart system are now sync'ed with our Quickbooks Point of Sale. I have been repeatedly impressed by the prompt, knowledgeable and courteous technical customer service staff who always take the time to explain the problem and educate the customer. The product is able to do for us what no similar product can given that we run the Canadian version of QuickBooks but have US and Canadian online shopping carts and multiple currencies. When we were researching and considering a shopping cart integration the Webgility tech support was more helpful in our decision making process than our shopping cart provider and online marketing consultants combined! Thanks for going the extra mile. Nothing at the moment...the product does for us what it should and when it doesn't it get fixed in a timely manner. A big time saver because we no longer have to manually enter our Quickbooks data. It also allowed us to start using multiple shippers which has saved us a lot of money. Their priority support line is fantastic whenever we run into issues or have questions. The transition was challenging, but we knew that going in. Once we were up and running it's all been wonderful. For us it was simply tying our website, shipping and accounting systems together, as well as allowing us to use multiple shippers. Altogether it's probably added 3-5% to our gross income, even after you deduct the cost of Webgility itself. "Well worth the money spent"
Although the program has some occasional glitches, it saves us a ton of time. In the morning we can have 30-40 orders imported in to Quick-books within a couple of minutes. The tech guys are always nice & polite and most of them know what to do to fix the issue pretty quickly. Priority support starts later than standard support. If I have an issue first thing in the morning, I have to wait 3 hours for my Priority support while non priority support is already there. That is not Priority..
We are a construction equipment & parts dealer and none of us will win any awards for our typing skills or speed. Being able to import orders as quickly as we do with this system saves us a ton of time & money. "This software is a very good solution for us"
The interface it creates between our online shop and Quickbooks. Not too much. The support team had a difficult time adding our second user to sync with QB, that took a long time, but once it was resolved, it worked great. Translation time between our online shop and our back end books is significantly reduced. "Long time user and hope to keep it that way." Sometimes their customer service queue is exceptionally long. Also, there are many features that I am not aware of and no easy way to find out about them. Worth considering. Steep learning curve, but easy to manage after that. Also, Webgility does not inform of the new features that are available. Saves countless hours of inputting customer data into quickbooks. Also reduces errors to nil. 99% of the time if there is an error it is the customer's. "Efficient tool for transferring order data to Quickbooks"
The customer support is readily available and helpful to fix any challenges we face. Sometimes the system misses transferring an order here and thee. Customer service was unable to explain why it happned, so we have to pay closer attention to our transfers to ensure none are missed. There is a fair amount of setup for your products. It's helpful to be familiar with Quickbooks and Big Commerce in advance to ease your transition to using this tool. We needed a method for getting Big Commerce orders into Quickbooks. This tool has accomplished that task for us. Easy installation! Great support! The support team will schedule a setup session where they walk you through step by step on the installation and configuration. Excellent speed. Connects well to Quickbooks with Amazon and our Ecommerce site on Magento. A great deal more functionality than what we use. Booking an install appointment with tech support was easy however, be prepared to wait at least a week for the appointment. Saving the need to double enter orders and update customer with shipping details. We've had other like products from other companies. ECC support is far-and-away, top-notch. I've never had a problem they didn't resolve within minutes to hours. Ticket response is first rate. At the moment, I dislike nothing actually. Support. When you use specialised software, support is paramount. I love how that have us valued as a customer, helping us to solve any issue right when we call. I don't like how it seems like we run into little problems with every update. Don't get me wrong, they always help to iron them out ASAP. Definitely give it a go! It is worth it. We are now able to post orders to Quickbooks from our website, which is great. We save so much time with this new process. "Software has too many bugs - Just does not work"
The scheduler does not work all the time, causing constant syncing issues. The default settings get changed by different support staff or software upgrades causing issues. I spend too much time with support trying to fix things instead of running my business. Software is just not stable. "Simple Set up and great Training support"
The implementation and training were very helpful. The sales process could have been a little more informative on the technical side. Be sure you have QuickBooks set up properly or consider this as an opportunity to start a new set up books. Looking simplify entering sales from multiple e-commerce channels. This will save our business hours per week that we can spend on generating more revenue. Unify was intimidating at first for my small business but now with the great support help it's a marvelous, invaluable business tool. Save yourself unnecessary hours and hours of tedious data entry and use Unify. First rate customer service and tech support. It would take us hours to do what Unify does instantaneously. * We monitor all Webgility reviews to prevent fraudulent reviews and keep review quality high. We do not post reviews by company employees or direct competitors. Validated reviews require the user to submit a screenshot of the product containing their user ID, in order to verify a user is an actual user of the product. Hi there! Are you looking to implement a solution like Webgility?